We have only one week left. Have you had your say yet? Have you read about the proposals for Leatherhead and given your comments? If not, click here. Many have commented on the proposed sites south of Windmill Drive and south of Yarm Way. But it is the integrity of the whole of Leatherhead that is threatened. Do you want there to be continuous ribbon development from Ewell through to Effingham and beyond, with even more of Surrey in danger of being subsumed into Greater London? One purpose of the Green Belt is to keep communities separate and prevent just such continuous urban development. Our Green Belt has already been compromised by the M25, we need to hold on to what is remaining to us. Also there is simply not the infrastructure to support any more development. Our schools are barely coping with the existing population; there is, as Cllr Tim Hall told the meeting on 6th February, no more room in them. Our roads cannot adequately cope with present demand at peak periods, and traffic is often at a standstill, with consequent increase in air pollution. Any new development will inevitably worsen things. Save Poors Allotment! Support Lucy Quinnel and the Friends of Teazle Wood who have worked so hard to restore and protect this ancient woodland which is part of our inheritance! Support your whole town! And please, I beg, do not go wishing houses onto others that you do not want next to you. That, in my opinion, would be very mean spirited. Enough is enough! Leatherhead is full! 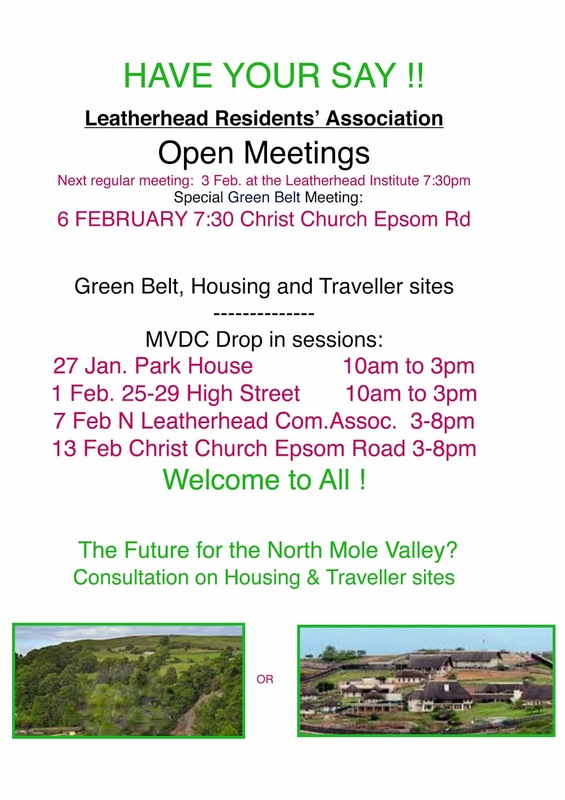 Mole Valley Green Belt Group Meeting 6th Feb.
A big thanks to all who turned up at this meeting – it packed Christ Church’s large hall. There were in excess of 100 present. The size of the turn-out on such a horrid evening should have left no doubt to councillors present about the strength of feeling on this issue! Note: Chris Smith’s and Roland McKinney’s files are PowerPoint presentations. It has been brought to our notice that Mole Valley residents are receiving telephone calls from a person stating to be from a company called National Security, or The Crime Prevention agency asking questions about home security. Apparently they know the name of the person they are calling and sound very convincing. Sometimes an appointment is made for the security advisor to call at the address to carry out a survey of security. So far there have not been any crimes linked to these calls but I would ask everyone to be vigilant if you receive calls from companies asking about your home security or offering to install alarm systems. Do not give them any personal information over the telephone and take as many details as possible about the person, or company and do some homework. Have a look on the internet for details of the company and if possible speak to Trading Standards. If you are interested in having an alarm installed contact one of the reputable companies. If you feel that you would like some security advice for your home I would be pleased to do this for you in the first instance. DO NOT make any appointments for people to visit your home unless you are completely sure of the company and who you are talking to. Residents of Mole Valley area are warmly invited to the District’s Crime Summit which takes place on 3rd March 2014 at Dorking Halls. The event will run from 5.30pm to 9pm. During the event there will be two sessions where residents can have the opportunity to hear from Mole Valley District Council, Surrey Police and the Police and Crime Commissioner, Kevin Hurley, and have a chance to ask questions. These sessions will run from 6pm to 7pm and from 7.30pm to 8.30pm. 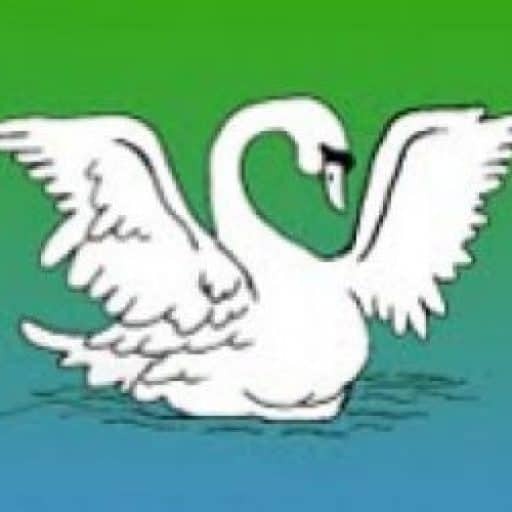 In addition, there will be information stands and a chance for residents of Mole Valley to talk to police officers and Mole Valley council staff about local issues. Registration opens at the event at 5.30pm. Refreshments will be provided. We would like to invite you to the next local Leatherhead meeting regarding RideLondon on Thursday 20 March at Leatherhead Theatre at 18:00. The meeting is intended as an update to the meeting held in November and to confirm planning for Augusts’ event. If there are additional attendees that you feel would benefit from the meeting, please extend our invite or they are welcome to contact me. Another invitation will be sent closer to the time. Please let me know if you have any questions or if you are unable to attend. 2. Minutes of last Open Meeting on 4th December 2013. 3. Matters arising– the decision to hold a further meeting..
4. Correspondence: The Sec. has heard from a number of people regarding the meeting on 16 Jan and also from the newspapers she contacted about the meeting on Thursday, 6th. If time allows, a description of what the Sec. sees happening at that meeting. d. Membership and Publicity (Hilary). 8. Newsletter, a call for articles. Firstly, can I take this opportunity to wish everyone a happy new year. I have just received an email from Trading Standards (although it’s dated 3rd January), which includes details of a couple of scams going on at the moment, and I have attached a copy to this post for your information. I would be grateful if you could pass this information onto anyone that you feel would benefit from knowing about this type of thing. If you are aware of any other scams which you feel people would benefit from knowing about please send them onto me and I will send out a generic email to everyone. Also, with the wet weather we are having at the moment it’s possible that shed, or garage doors and windows may have expanded and may not close, or fit properly. Please be aware that burglars do take advantage of open sheds etc., and will steal any items of value. Sheds are also a good option to obtain items such as garden tools to use to break into houses. Please check your outbuildings are secure with a suitable lock, and outside lighting if possible. I am always happy to provide security advice should you feel you need it. I would inform you that there were some vehicles broken into overnight last night in the South Leatherhead area and we are in the process of investigating these. I think this would be a timely reminder for everyone to ensure that you do not leave any valuables in your vehicles when parked, even on your own driveway. This includes items such as SatNavs, bags, phones, parcels, expensive coats, and even any change that you may leave in the centre console. You should not leave valuables in your glove compartment either as this is the first place thieves look if they access your vehicle. SatNav cradles should be removed from your vehicle when not in use and the ring mark cleaned from your glass as this advertises to everyone that you have a SatNav and that it may be hidden somewhere in your vehicle. Also, please ensure that your vehicle is locked even when parking on your driveway as your insurance company may not accept your claim if your vehicle is found to be insecure. Please do not be too concerned as this type of crime, and crime as a whole is very low in Mole Valley at the present time. I would be grateful if you could pass this message onto people that you may know even if they live outside of the area. If you notice anything suspicious please call us on 101 or in an emergency 999.